(adjective) The term colonial describes bird species that nest and breed in close proximity as a group, often sharing communal behaviors for the benefit of the entire group, including both adults and chicks. The size of the colony can vary from just a few breeding pairs to hundreds or thousands of birds depending on the species and the availability of resources. While many birds are very isolated and secretive when nesting in order to protect their offspring, colonial birds are just the opposite. A colonial nesting ground may have hundreds or thousands of nests in a small area, and different pairs of birds may nest within a few feet or even a few inches of one another. The better the nesting ground - with suitable nest sites and abundant food sources - the more birds will take advantage of it. In most cases nesting colonies are just a single species, though some other bird species may casually nest nearby or along the colonies fringes to take advantage of mutual benefits. The most popular nesting colony sites are often those that are relatively inaccessible to predators and other intruders. 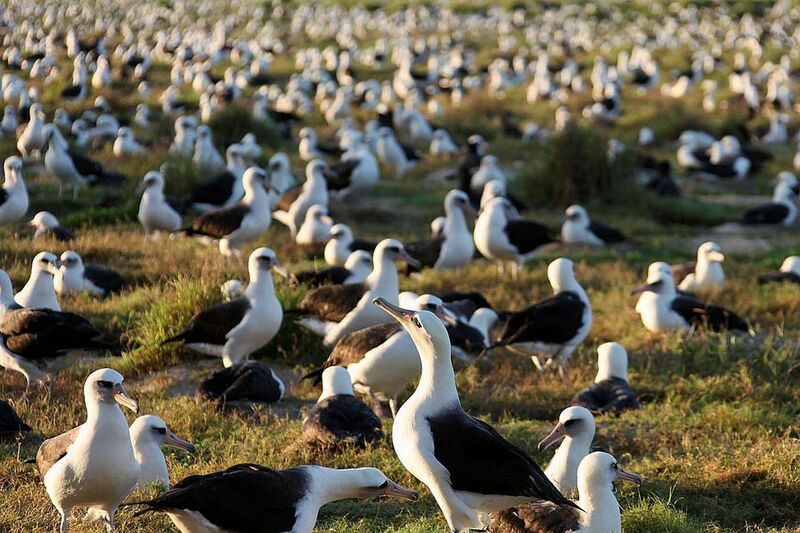 Rocky coastal islands, steep cliffs and large trees in open areas are often popular nesting sites for colonial birds. The same birds may return to those nesting areas for many years, even reusing nests or nesting materials each year. Nesting colonies can be very loud and filled with the vigorous activity of courting adults, begging chicks, nest repair and the normal comings and goings of birds. Feces, feathers and nest debris can accumulate rapidly, and some bird species, such as several types of penguins, will use that material for future nesting. With so many birds in one place, it may seem impossible for birds to recognize their mates or chicks. Adults in the colony often distinguish their own nests and young through subtle visual clues as well as distinct sounds. While these problems are severe enough, they are even more traumatic when a colonial species may be threatened or endangered. In these extreme cases, one bad event could dramatically impact the entire species, and it may take years for the breeding population to recover to its previous levels. Several years of difficulties could wipe out a nesting area entirely as no new birds are able to mature to begin nesting themselves. Birds that are gregarious year-round are often colonial breeders, including herons, egrets, flamingos, albatrosses, penguins, cormorants and swallows. Tropical species such as oropendulas and weaverbirds are also colonial, as are many different shorebirds and seabirds. In total, more than 10 percent of the world's bird species, or approximately 1,000-1,300 different bird species, are considered colonial. Birders, nature photographers, wildlife researchers and ornithologists may arrange special trips to these colonies to study or observe the birds. Many breeding colonies for endangered birds are protected against human disruptions, though limited studies or closely monitored visits may be permitted with proper authorization.